Will AUD Break 75 Cents? With hours to go before the Reserve Bank of Australia’s monetary policy announcement, the Australian dollar extended its gains for a second day in a row to 0.7498, just 2 pips shy of the key 75 cent level. Today’s gains had little to do with data as Australian service sector activity and inflation growth slowed. Job ads also grew by only 0.4%, down from 1.5% the previous month. These reports should make the Reserve Bank less optimistic but on a day like today when geopolitical events drove Aussie flows, that mattered little to FX traders. The decision by Gulf States to cut ties with Qatar sent AUD sharply higher. While Qatar is not a major oil producer, it is a major producer of liquefied natural gas. Australia is quickly becoming a major player in this market and should be a big beneficiary of Qatar’s diplomatic crisis. Saudi Arabia closed its borders and suspended air and sea travel between the 2 countries. In the long run, these developments will have a positive impact on Australia’s economy, but in the near term it may not be enough to please the RBA. 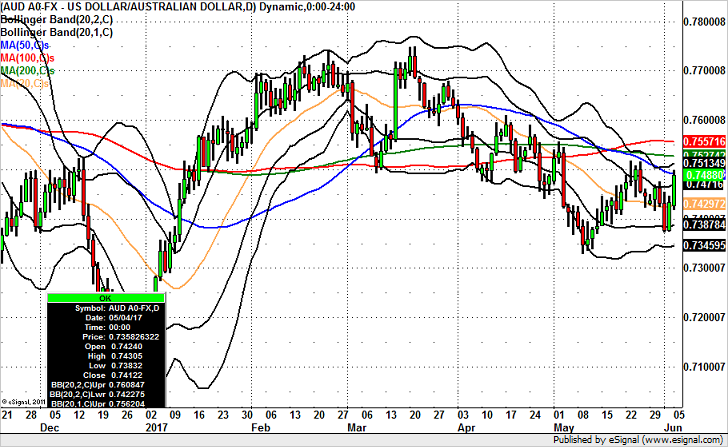 Technically, AUD/USD had a nice rally over the past few days but the rally stopped short of the 50-day SMA. There’s a lot of resistance for AUD/USD between 0.7500 and 0.7560 (see the moving averages) but if this range Is cleared, we could see AUD/USD rise as high as 77 cents. Until then, those are the levels to watch. If the RBA under delivers, AUD/USD should sink back to 0.7430 and possibly even lower.